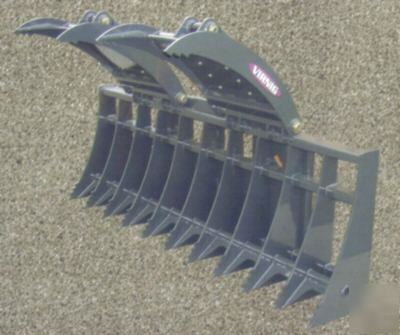 Brand New Virnig Model BRV84, 84" Heavy Duty Brush Rake Grapple. * Fits Skidsteers with the New Universal Skidsteer Quick Attach. * This Brush Rake Grapple includes Hydraulic Hoses & Flat Face Quick Couplers, it complete & ready to use. 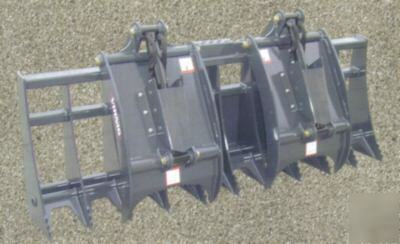 * This Brush Rake Grapple comes Standard with Hydraulic Cylinder Guards (shown in the photo below)!!! * Includes a 1 Year Warranty. * We are Glad to say All Virnig Attachments are Made in the USA!!! * Depth of Bucket - 17.88"
* Height of Bucket - 30.88"
* Tine Spacing (on center) - 8.63"
* Overall Grapple Width - 56"
* Independant Grapple Width - 21"
* Height with Grapple Closed - 39.75"
* Grapple Hinge Pin Diameter - 1.56"
* Cylinder Pin Diameter - 1.25"
For more photos and Specifications e-mail or call us at .